I am behind on the Saints. Today we celebrate St. Teresa Benedicta of The Cross (Edith Stein). Youngest of seven children in a Jewish family. Edith lost interest and faith in Judaism by age 13. Brilliant student and philosopher with an interest in phenomenology. Studied at the University of Göttingen, Germany and in Breisgau, Germany. Earned her doctorate in philosophy in 1916 at age 25. Witnessing the strength of faith of Catholic friends led her to an interest in Catholicism, which led to studying a catechism on her own, which led to “reading herself into” the Faith. Converted to Catholicism in Cologne, Germany; baptized in Saint Martin’s church, Bad Bergzabern, Germany on 1 January 1922. 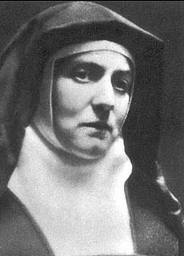 Carmelite nun in 1934, taking the name Teresa Benedicta of the Cross. Teacher in the Dominican school in Speyer, Germany and lecturer at the Educational Institute in Munich, Germany. However, anti-Jewish pressure from the Nazis forced her to resign both positions. Profound spiritual writer. Both Jewish and Catholic, she was smuggled out of Germany, and assigned to Echt, Netherlands in 1938. When the Nazis invaded the Netherlands, she and her sister Rose, also a convert to Catholicism, were captured and sent to the concentration camp at Auschwitz where they died in the ovens like so many others. Here is her biography at the Vatican site. This entry was posted in Saints and tagged Catholic Saints, concentration camp, Edith Stein, Nazis, philosophy. Bookmark the permalink.